Most of the fully-3D VR content that exists today has been created by teams of highly technical and talented individuals with experience using professional 3D art tools or with a background in programming. The steep learning curve and difficulty of building for VR has, so far, limited the amount of available content. While Oculus, Sony, and HTC all sold through their initial batch of preorders fairly quickly, there’s still doubt whether or not there will be enough compelling content for users to put on their VR headsets daily or even weekly. This repeat usage will be critical to push VR past the early-adopter stage that all successful platforms need to overcome. One of the drivers of adoption for the web was the democratization of content creation. Sites like WordPress, Weebly, and Shopify allow anyone to quickly create and upload a website, making it accessible to everyone on the internet. By enabling everyone to create content, the web benefited from network effects; starting a flywheel that attracted consumers and creators alike. WordPress, in particular, is worth focusing on because it was one of the first ways that a non-technical user could create a website. WordPress now accounts for around 25% of the web. This is a staggering number given the size and scope of the web. I believe that companies that help users create content in 3D for VR will have similar opportunities for massive adoption. VR content, however, is all 3D and, historically, creating 3D content has been hard. This is because, traditionally, 3D content is created using 2D interfaces and requires the user to have a level of comfort with visualizing how 2D interactions will modify a 3D object. Additionally, most 3D editing tools target professional or semi-professional users with complicated and dense user interfaces. 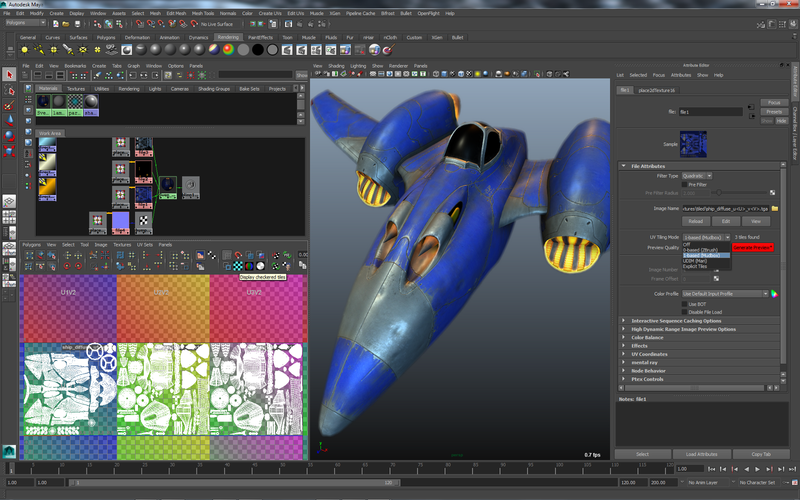 Autodesk Maya, a popular professional 3D editing app. It’s hard to learn. Arguably, the most popular and user-friendly 3D creation app is the 3D sandbox game Minecraft. After examining the user interaction model, it’s easy to understand why. Creating content in Minecraft consists of walking up to a spot and either adding or removing a cube. This simple operation is enough to let people express their creativity. Similar to WordPress, Minecraft was incredibly popular and has sold over 70M copies. Users have been able to create large scale artwork, cities, and even a functioning computer. Some of these creations took years to complete. With the hand-tracking capabilities of the HTC Vive, Oculus Touch, and Playstation Move controllers, there are now opportunities to develop new ways to interact with and create 3D content. One of the more promising ideas is to create 3D VR content while in VR. This means that a user wearing a VR headset can interact with a 3D virtual world around them, molding and shaping it to whatever they can imagine using the hand-tracked controllers. There have already been multiple apps released to make it easier to create content for VR within VR. Tilt Brush, the VR painting app owned by Google, and Medium, the sculpting app by Oculus, are both enabling non-technical people to easily start creating content for VR. There are advantages to creating content for VR within VR itself. One major advantage is that “what you see is what you get” (WYSIWYG). WYSIWYG is important for the creation of web sites because it masks the complexity of the underlying HTML and CSS that makes the webpage. Instead, users can focus on the directly on the look and the creative aspects of the site while being reasonably confident it will look the same once published. WYSIWIG for VR enables people to focus on whatever they are creating at the moment. I’ve personally seen dozens of users new to VR use Tilt Brush and intuitively start drawing 3D characters and objects without ever thinking about the complex math that is going on under the covers. The path to fully accessible VR content creation is just beginning and there will likely be several iterations before someone invents the WordPress or MineCraft of VR content creation. When we do, however, it will be a big step towards making VR a mass-market platform.